On this Episode of the Theme Park Duo Podcast, The Duo take an adventure down the 91 freeway to a little place called Buena Park to visit one of their favorite parks, Knott’s Berry Farm. 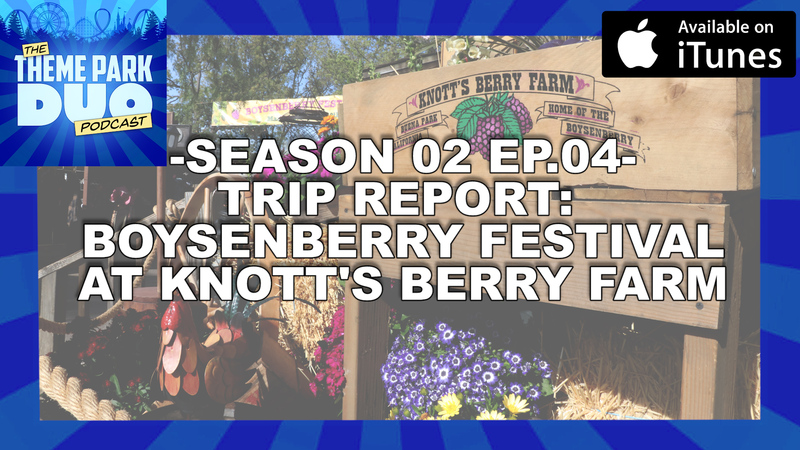 During this time of year, Knott’s throws their annual Boysenberry Festival! This is the ultimate location to eat foods inspired by the boysenberry and the history of the farm itself. Learn about all of our favorite food offerings, entertainment options, and specialized merchandise. Before we jump into our trip report, we have a Theme Park Bulletin! We chat about the announcement Disney has made about it adding 3 new Marvel themed areas to it’s parks. Specifically Paris, Hong Kong and Disney California Adventure. On top of that, we discuss the reopening of Pirates of the Caribbean in Walt Disney World and it’s changed Red Head scene. Then finally we discuss the recent parking fees being added to the Walt Disney World hotels in Orlando. Then we quickly discuss our exciting news that we shared on social media earlier this month! Hold on tight! Because this is going to be a crazy episode! Knott’s Berry Farm’s Boysenberry Festival 2018 Strikes Gold!